The world cries out against weak men, because it stands or falls by their strength. Truly, the battle for the world is fought in the hearts of Christian men. The world’s answer to the weak effeminate is “cowboy up, be your own man.” Agreed, an important aspect of manhood is the ability to stand on your own two feet; when the world is against you, to stand as Athanasius did, one man against the world. But men are never to be autonomous–operating solely by their own law, under no one else’s authority. 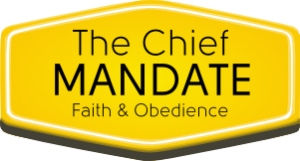 The Christian man is to be God’s man–quite literally His servant or slave. Like a soldier under his commanding officer. Keeping his body and mind under his own authority, but subjecting everything to Christ. How can you expect to bring your sphere of influence under the feet of Christ if you yourself are not so subjected? My answer, and Paul’s answer in Romans 8 & 9 is this: humble yourself, and be God’s man. And when you humble yourself, God will exalt you; when you rest in His provision, he will give you the desires of your heart. Will not the God who gave us reconciliation through the gift of His Son, and who owns the cattle on every hill, be sure to abundantly bless us as we trust in Him? And that’s a true man: self controlled, under the subjection of Christ, and willing to do the work of God even if it means opposing the entire world for the name of Jesus.